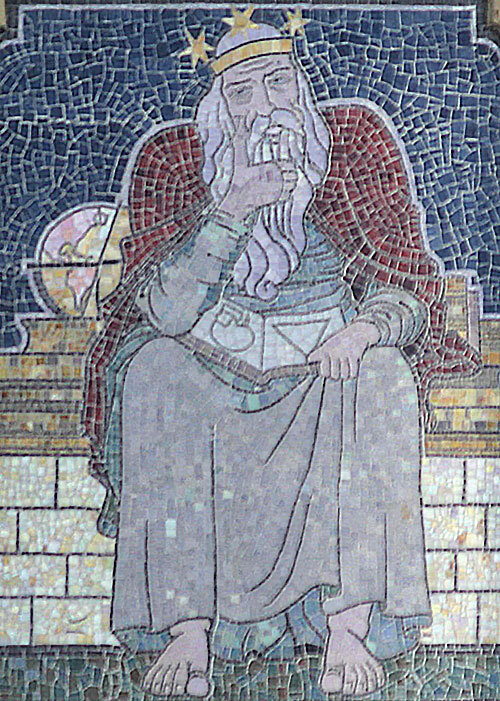 1 C. F. A. Voysey (1857-1941) – a mosaic figure of Archimedes, the great scientist and mathematician of the ancient world. The mosaic was on the tower of science block of the new University of Wales at Aberystwyth in Ceredigion. The University was the largest architectural project of John Pollard Seddon (1827-1906), a Gothic Revival Architect with whom Voysey was serving his five years as articled pupil. Archimedes is flanked by other panels showing young men kneeling to offer him symbols of progress – a locomotive and a steamship. The mosaics are Voysey’s earliest surviving designs. He was seventeen or eighteen when they were executed. 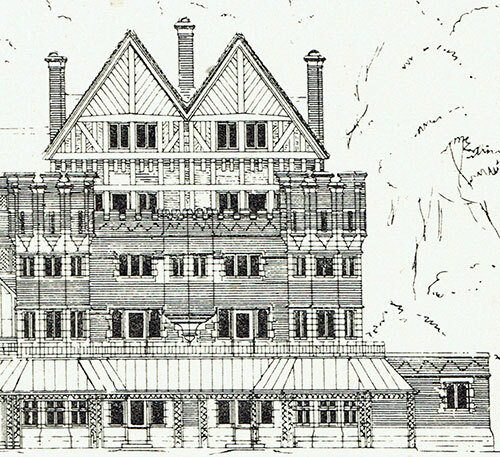 2 Voysey’s earliest existing architectural design executed between 1882 and 1884. Part of the South front of a private sanatorium on a hill above Teignmouth in South Devon. It was never built. These two mirrored sections were possibly to accommodate male and female patients. Voysey was twenty-five when he began working on the sanatorium project. His design is confident and inventive. 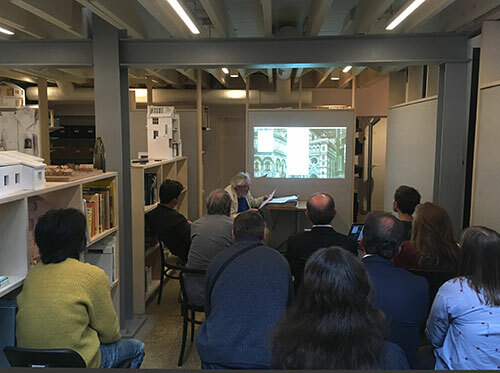 It shows the impact of five years with Seddon, to whom he had been articled, and George Devey, the leading country house architect, for whom he had worked. Devey excelled at brick buildings. Voysey’s design also suggests the influence of Richard Norman Shaw who in the 1860s and 1870s led the revival of timbering for large country houses. 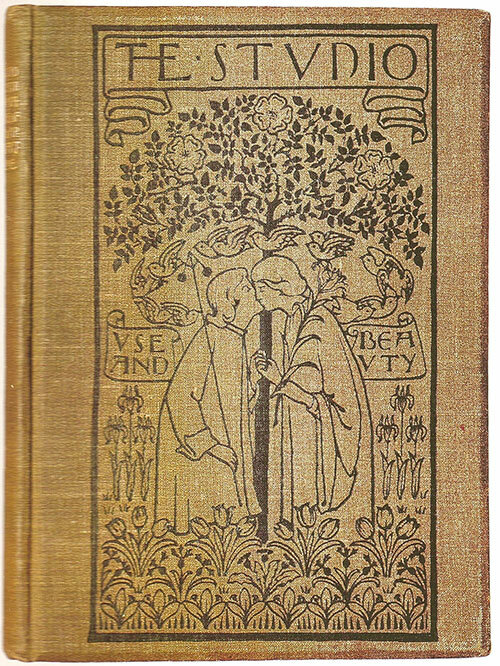 3 Voysey’s design for the publisher’s binding of the first six monthly issues of The Studio which began publication in May 1893. ‘Use’ holds the governor of steam-engine, while ‘Beauty’ holds a lily – a distinct residue of the Pre-Raphaelitism Voysey would have encountered in John Pollard Seddon’s office while serving his articles. The Studio was the first popular art magazine and it soon had an international circulation and influence. Voysey made frequent appearances in The Studio. The magazine helped him become the best-known domestic architect of his generation. 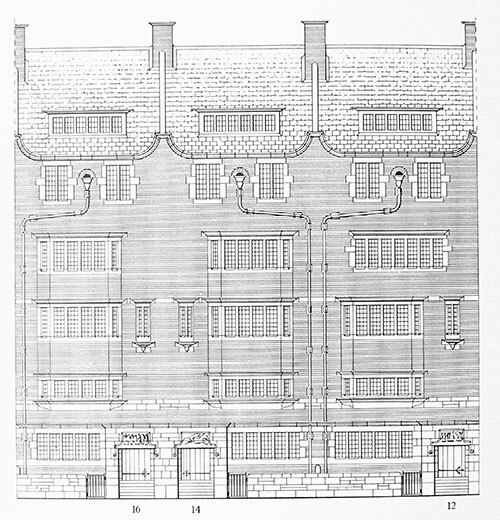 4 14 and 16, Hans Road, Knightsbridge, by C. F. A. Voysey (1857-1941). These are Voysey’s only town houses, His client was Archibald Grove (1855-1920), a Liberal Member of Parliament, publisher and editor of a literary magazine – The New Review founded in 1889. The magazine promoted the work the progressive writers of the 1890s – Kenneth Grahame, Henry James, Kipling, H G Wells, Yeats and women writers, including Vernon Lee, Olive Schreiner and Katherine Tynan. Among Grove’s early tenants was Julian Russell Sturgis (1848-1904) – a wealthy and successful novelist, poet and librettist. Sturgis commissioned Voysey to design his country house – Greyfriars – on the Hogs Back in Surrey. It was one of Voysey’s finest houses. Greyfriars marked a pivotal point in his career. Voysey became an architect much favoured by forward looking intellectuals – among those for whom he designed houses were : the parents of Aldous Huxley, Algernon Methuen, publisher of avantgarde writers, E J Horniman, Liberal MP, anthropologist and philanthropist and H G Wells who wrote two of his best-loved books in Spade House, Sandgate, Kent, built in 1899 – Kipps and Tono Bungay.